Our Pomskies are not just mothers to the puppies, they are our family. Brought up in our home environment, taken on training classes and even on holiday with us. Our girls are as much family to us as our children and no expense is spared in their upbringing. All our dogs are socialised with both adults and children of all ages, along with other dogs from a young age both in and out of the home environment (dependant on age and vaccination status) in order to set them up for a successful life in their new homes. Our children play a great role in helping the puppies adapt to new people, sounds and experiences and this ensures our puppies are the perfect addition to any home. Your new puppy will come home to you with a puppy pack including a blanket with mums scent, in order to help your puppy settle a little easier in their new home. We will already have started toilet training your puppy, and so once home with you, your puppy will have an understanding of where to toilet and be able to communicate with you their need to toilet. We send all our puppies to their new homes with 4 weeks free petplan insurance so you can enjoy settling in your puppy straight away. We wean our puppies onto a raw diet as we feel this is the most beneficial diet for them, as many people who will have looked into the Husky breed will be aware of their sensitive tummies. Due to Pomskies being a cross breed of a Husky this can be apparent in some Pomskies and to counter this we start them on a raw diet to eliminate grains and other fillers from their diet which in most cases can be the cause of upset tummies due to food allergies. We can provide you with help on how to feed a raw diet if you require, and also if you do prefer to feed kibble we can recommend high quality kibbles which are grain free. Prestige puppies are bred for quality and not quantity, we offer an extensive 12 month Health Guarantee for all of our puppies and work closely with our vet to ensure all of our dogs and puppies receives the highest care and are in perfect health when leaving us. All of our dogs are health screened and we BVA test our dogs before they join the breeding pack to ensure our puppies are as healthy as possible. 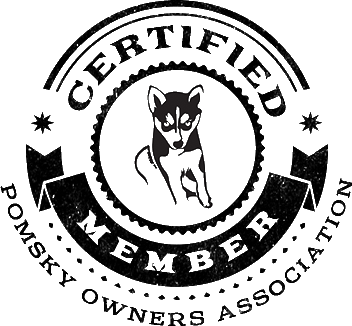 Once you have a puppy from ourselves we offer continued support and encourage all owners to keep in touch as part of our Pomsky family. We are based on the outskirts of Derbyshire, England, and surrounded by countryside for our dogs to explore. We hope you enjoy looking through our site, and please contact us with any questions you may have.